Joe Seroka founded The Seroka Group in 1960 as a creative marketing solutions agency that would provide customer-centric services. His expertise was sales promotion and visual communication but over the next 23 years he became an expert in strategic marketing and public affairs. He opened an office in New York City to support his Manhattan-based clients, but the focus of the agency in the 1960s and 1970s revolved around companies based in Westchester and Fairfield Counties. Clients served included: Time Magazine, IBM, BF Goodrich, Union Savings Bank, AMF, ITT Continental Baking, Warner-Lambert, Rye Town Hilton and Stouffer's Inn of Westchester. Some Seroka Group business relationships spanned up to 18 years. One notable top secret project involved the national rollout of a new freeze dried coffee product from Nestle Foods. Joe created the original package design for Taster's Choice coffee. Paul Seroka joined the firm and introduced computing-based publishing into the company that utilized new technologies. He taught clients how to get work done faster, with higher quality, for less money by adopting new services such as desktop video and multimedia computer-based presentation services. Clients served in the 1980s and 1990s included: Van Eck Securities Corporation, MONY Financial Services, SanPellegrino USA, Benfield Electric, Raymond Keyes Associates, Lawyers Title Insurance Corporation and small business owners and entrepreneurs. Between 2000 and 2010, Paul Seroka focused on completing engagements from high-growth, entrepreneurial organizations that required both strategic counsel and TSG's tactical marketing services. He managed multi-million marketing budgets and completed successful programs for Champion Energy Corporation, Fine Host Corporation and Greenwich Technology Partners. Today, The Seroka Group's marketing and corporate communication executives are supported by talented writers, graphic designers, video and technology-oriented communication professionals. The agency has completed hundreds of marketing engagements for over 100 leading corporations throughout the United States. 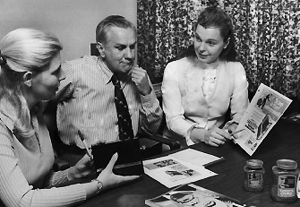 Sue Knight, Joe Seroka and Marie Seroka discussing the product marketing strategy and brand rollout of Taster's Choice coffee, 1965. 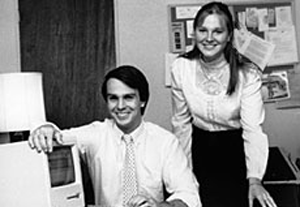 Paul Seroka and Nancy Seroka with their first computer, a 128K Macintosh, days after the product was shipped, February 1984. 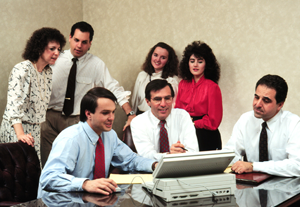 The Seroka Group team in the late 1980s at work before a client seminar at the White Plains, NY office.